Referencias bibliograficas: Augé J, Vent J, Agache I, Airaksinen L, Campo Mozo P, Chaker A, Cingi C, Durham S, Fokkens W, Gevaert P, Giotakis A, Hellings P, Herknerova M, Hox V, Klimek L, La Melia C, Mullol J, Muluk NB, Muraro A, Naito K, Pfaar O, Riechelmann H, Rondon C, Rudenko M, Samolinski B, Tasca I, Tomazic P, Vogt K, Wagenmann M, Yeryomenko G, Zhang L, Mösges R. EAACI Position paper on the standardization of nasal allergen challenges. Allergy. 2018 Aug;73(8):1597-1608. doi: 10.1111/all.13416. PubMed PMID: 29377177. Bousquet J, Agache I, Aliberti MR, et al. Referencias bibliograficas: Bousquet J, Agache I, Aliberti MR, et al. Transfer of innovation on allergic rhinitis and asthma multimorbidity in the elderly (MACVIA ARIA) EIP on AHA Twinning Reference Site (GARD research demonstration project). Allergy. 2018;73:77–92. Referencias bibliograficas: Wise SK, Lin SY, Toskala E. International consensus statement on allergy and rhinology: allergic rhinitis-executive summary. Int Forum Allergy Rhinol 2018;8(2):85-107. doi: 10.1002/alr.22070. PubMed PMID: 29438600. Referencias bibliograficas: Mariño-Sánchez FS, Valls-Mateus M, Ruiz-Echevarría K, Alobid I, Cardenas-Escalante P, Jiménez-Feijoo R, Lozano-Blasco J, Giner-Muñoz MT, Rodríguez-Jorge J, Haag O, Plaza-Martin AM, Mullol J. Nasal obstructive disorders induce medical treatment failure in paediatric persistent allergic rhinitis (The NODPAR Study). Pediatr Allergy Immunol 2017;28(2):176-184. 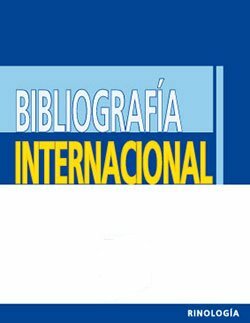 Referencias bibliograficas: Muñoz-Cano R, Ainsua-Enrich E, Torres-Atencio I, Martin M, Sánchez-López J, Bartra J, Picado C, Mullol J, Valero A. Effects of Rupatadine on Platelet- Activating Factor–Induced Human Mast Cell Degranulation Compared With Desloratadine and Levocetirizine (The MASPAF Study). J Investig Allergol Clin Immunol 2017; Vol. 27(3): 161-168.